FACT CHECK: Does This Photograph Show Two Boys — One Vaccinated, One Not — Who Were Exposed to Smallpox? Does This Photograph Show Two Boys — One Vaccinated, One Not — Who Were Exposed to Smallpox? In the early 1900s, Allan Warner documented several cases of smallpox and the effects of vaccinations. A photograph shows the dramatic differences in two boys who were exposed to the same smallpox source. 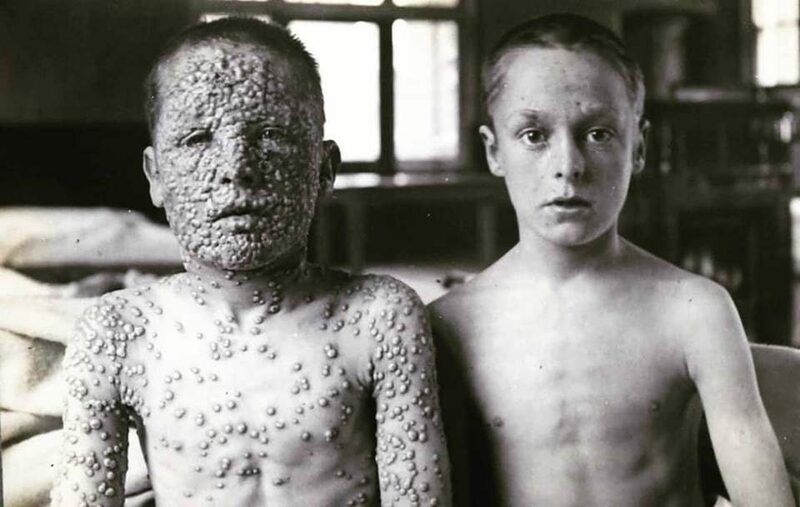 These two boys had been exposed to the same smallpox source. One had been vaccinated, the other hadn’t. Smallpox of all the eruptive fevers best lends itself to illustration by photograph, and the photographs in this fasciculus of the eruption of smallpox which it has been our good fortune to see. They are the work of Dr. Allan Warner of the Isolation Hospital at Leicester, and they show very distinctly the different stages and varieties of the small pox eruption. Their value is enhanced by the fact that the progress of the eruption is illustrated by a series of plates of one and the same patient, both in the discrete and in the confluent variety of the fever. Other plates are given showing cases of mild smallpox as it occurs in the vaccinated, and we are particularly impressed by the concluding series of photographs in which the advantages of vaccinations are well brought out by the method of showing side by side individuals infected from the same source, of whom one has been vaccinated and the other not. 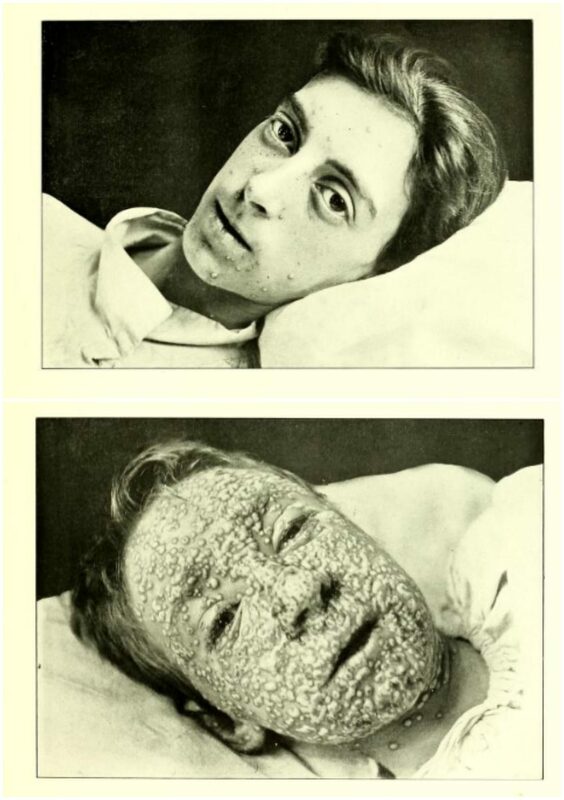 These pictures would be of the greatest use to those who give popular lectures on vaccination, and are also very useful as illustrations of modified smallpox. Shows two boys, both aged 13 years. The one on the right was vaccinated in infancy, the other was not vaccinated. They were both infected from the same source on the same day. Note that while the one on the left is in the fully pustular stage, the one on the right has had only two spots, which have aborted and have already scabbed. Two sisters infected with smallpox on the same day from the same source. Upper figure. Girl aged 21 years, vaccinated in infancy. Lower figure. Girl aged 15 years, unvaccinated. The Members of Parliament were anti-vaccination. Gloucester, which of course was Jenner’s own county town, was one such centre. So to were Leeds, Leicester, Glasgow and Liverpool amongst others. Here is one magnificent demonstration of the fact that vaccination works, but only if you have it. If you do not have it, it is not going to work. The lad on the left and the lad on the right were members of the same class at school, and they met the same index case who was brewing up smallpox on the same day. The lad on the right, obviously, had been vaccinated. The lad on the left, his parents, who had been whipped up by the local MP, had refused to have their son vaccinated, with obvious consequences. Gresham University. 28 September 2011.